FREEBIE!! This will be free for this weekend only! 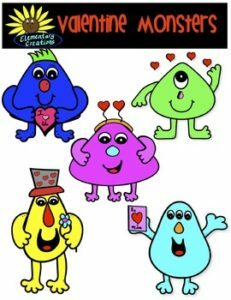 These are fun and colorful monster clipart that can be used for Valentine’s day. You can use them for personal or commercial use. There are 5 silly monsters plus there BW set for a total of 10 monsters. All graphics are saved in a PNG format and have high resolution. If you distribute the graphics for a fee or for free I do ask that you give credit back to me. Simple add my store logo or my link to your product. Thank you for stopping by! Don’t forget to leave me feedback, so you can get your TPT credit! !